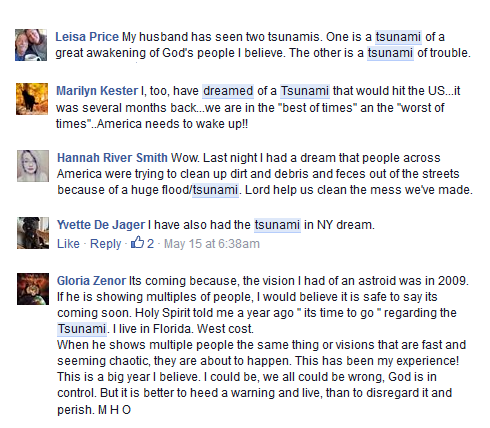 Many people around the world are having dreams of a tsunami hitting the east coast of the United States. 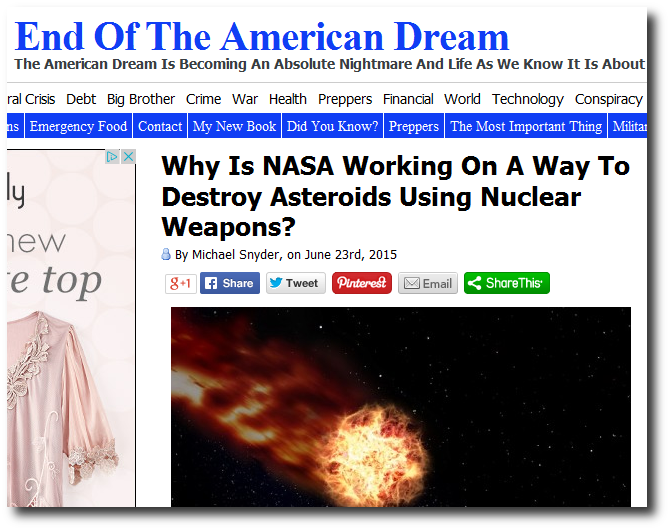 Over the months, I have collected a number of these dreams in this post. One thing that all the dreams have in common is they see this tsunami hitting the east coast, and the wave seems unusually large. In two of the visions, they say that both coasts, (east and west coasts) will be hit, but these could be two different events. The New Madrid fault line gets a lot of minor quakes, and has lot of associated fault lines running in a number of directions. One fault line runs to the Gulf and yet connects with another fault line running up from the Gulf, along the eastern sea board to Charleston, South Carolina and Boston. What makes the New Madrid so devastating is something called “liquefaction”. Quakes on rocks are jolts, usually a single jolt. When insistent giggling on mud, like the Mississippi mud, and everything is turned into a type of quicksand, which wouldn’t leave much standing. Why does North America have a fault line running through the middle of the plain? It is due to a diagonal pull in the North America continent. As the Atlantic widens at the equator, Mexico is pulled to the west, while New England area is nailed into place. So what is causing this diagonal pull? The North American plate is locked in at the top, squared off like a block head, so it cannot roll when it pulls apart at the equator. River valleys are always a weak spot where the plate is thin. While for North America, this is right along the Mississippi, right through the New Madrid. A diagonal pull between New England and Mexico, would have disasters occurring along the line between these two points. 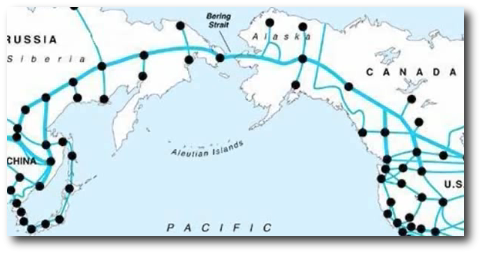 This diagonal pull causes the land around the Mississippi to move in different directions.While the west coast does it’s adjustment, the North American continent is being bowed. With Mexico is pulled west, a bow is formed, from the tip of Alaska to Mexico. At some point, the New Madrid will give way in fits and starts at first. After major adjustments in the New Madrid fault line, the west coast will adjust relieving the tension in the bow. There is pressure along the west coast of course, this will result in the predictable volcanic increases, and west coast earthquakes. The primary result proceeding will be the ripping action with a plate unable to move must endure. 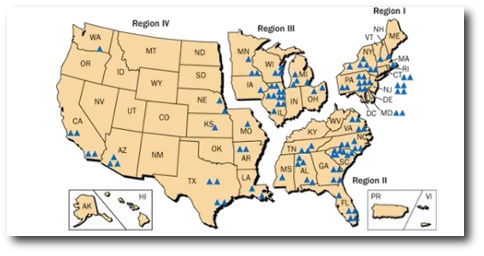 The notable area of catastrophe is the eastern half of the continental US. From Houston To Chicago, to New England. 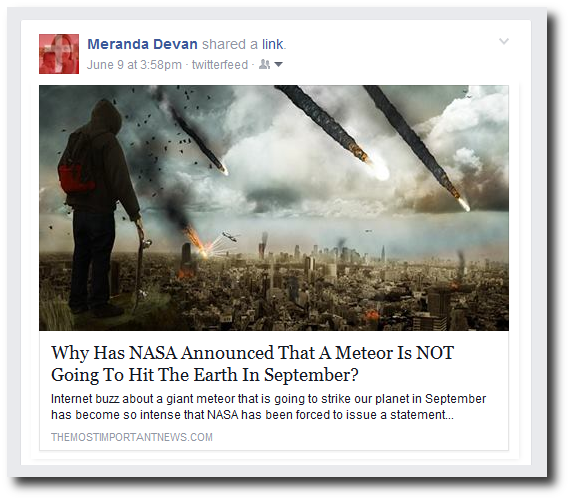 At around 4:08, they site an event that occurred in August 8, 2007, when a stench (methane gas) was smelled across the US. Birds dropped dead in Austin Texas. Look at this map where they put stars around the areas that this methane gas was noted the most. Most of these areas are the exact areas that most people mention in their dreams. If you had a dream, leave a comment in the comment section below. Relax. It was only a drill. Had it been a real emergency, you would have been instructed to kiss the world – or a large chunk of it – goodbye. 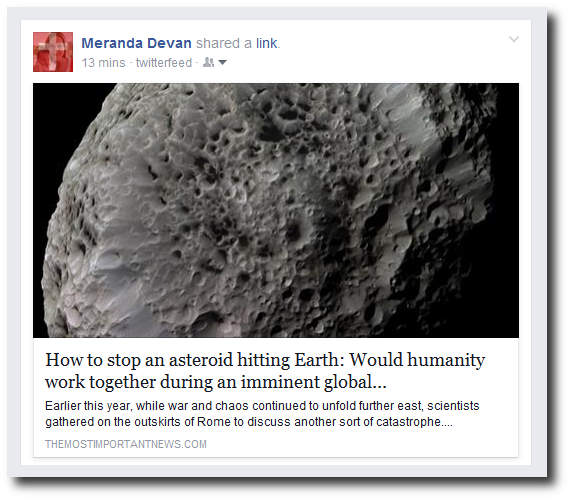 Internet buzz about a giant meteor that is going to strike our planet in September has become so intense that NASA has been forced to issue a statement publicly denying that it is going to happen. John Paul Jackson said both coasts will be hit by a tsunami, but he said he didn’t know the timing. He said the east coast one will be caused by an unusual event. What he saw hit New York City, but he wasn’t sure how far south down the east coast it came, but somewhere south and somewhere north of there were hit as well. Then he saw one coming to the west coast and hitting L.A., and several of the buildings that were 7-10 stories tall were under water. What you see in this graphic is the line which represents a fault line that runs right up to the Great Lakes. Leslie Johnson and Augusto Perez saw was the area highlighted around the New Madrid fault opening up. In 1981, Augusto Perez was called to salvation by a series of dreams, visions and personal experiences. He was a pastor of a church for seven years. 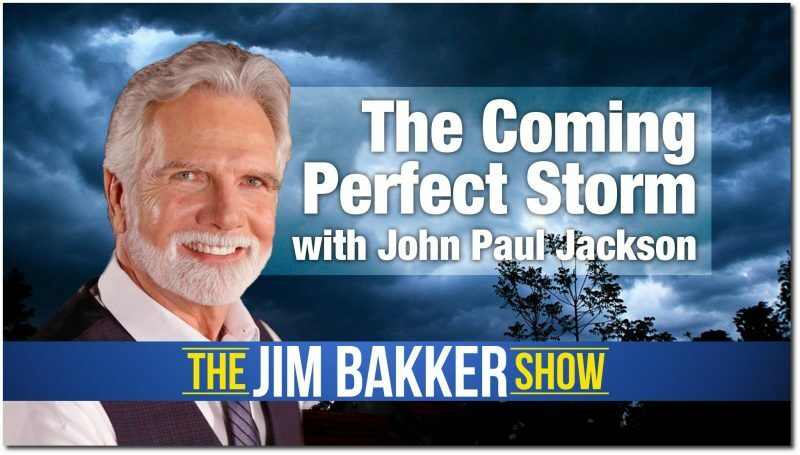 He has had 44 dreams and visions dealing with end time events. He saw visions of the great shaking, the coming famine, the coming attack on the US and so much more. ” Interpretation: The City of Chicago will suffer a terrorist attack, an earthquake or both causing much devastation in the city. We need to pray for that city and be ready to assist them when this happens, and preach the gospel to those that are there now. sea and the seashore becoming dry. I knew instantly it was a tsunami coming. I went down and tried to warn the people telling them they had twenty minutes to get out, but no one believed me. They kept on having a good time in the beach. In the distance I could see people in boats.I went back up to my room, and suddenly I saw boats of all sizes, catamarans and colorful sailboats by the hundreds coming in. People were scared and jumping off their boats as they ran towards the shore with a look of panic and horror in their faces as I could start to see the giant tsunami in the distance making its way towards the beach”. Pictures show St Johns pillars showing a tsunami above the twin towers in New York. In one of the images it shows the birthing of the Antichrist which Efraln Rodriguez also mentions will come after these events come and the church reduces in number. At 5:30 talks about a man who is in prison who had insider information about a coming tsunami on the east and west coast. He plays a clip of an interview with this man who is in prison. This person mentions that the New World Order wants these tsunami’s to come, in order to declare martial law, and to shut down the power grids. Ken Peters was shown this vision back in the 80’s before personal computers were in every home, as well as the modern day flat screen tv. “Another place I have been shown because of witchcraft is going to be in complete destruction, which I also talked about before, is going to be New York, this will also include New Jersey. She talks about an earthquake that works its way up through the gulf of Mexico, through America, and up to Canada. She sees this earthquake split the land in two. She warns of the pre-trib rapture and how it has caused the body of Christ not to be prepared. The severity of these tsunami’s can be held back a little bit but not all the way with prayer. He talks about how a group of Christians who were in a major disaster (maybe a tsunami), and they huddled around in a circle, and pleaded with the Lord, and were not touched. The water went around them. He goes on to talk about many cities which are going to be hit with nukes. He mentions that what he saw in his dream or vision, was these bombs didn’t do as much damage as he expected. Later he talks about Russian ships heading to our coastlines. He also talked about a GREAT famine coming to the USA. He saw floods coming in to the US. 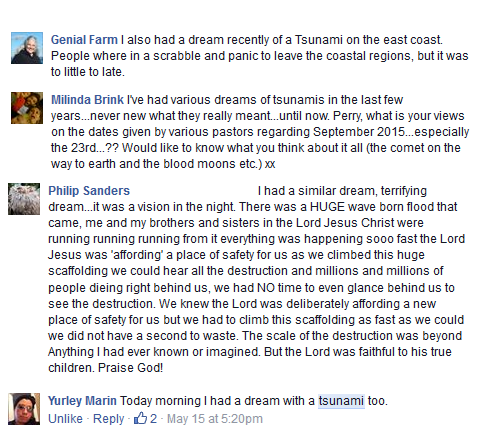 Dr. Patricia Green describes 2 prophetic dreams regarding the impending Tsunami that will hit the East Coast. She was given a dream in which she was told to warn the people to get out. She was told that Florida will be decimated, and Washington DC will be underwater, and New York would be flooded. In the morning of 22nd July 2014 at about 6:30am (East African Time, which is a few minutes ago as I post this) in a very mighty communication of The LORD God Almighty, The LORD Jesus Christ and The Holy Spirit through a prophetic supernatural dream (Vision of the night), The LORD spoke to me about The United states of America. So while this revelation and observation was going on in the vision, The LORD made me know that a very massive devastation and destruction is coming to New York City i.e. the city of New York in The United States of America is facing a potentially devastating moment. The LORD is thus calling for Repentance by the people of New York City; the people and the nation of the entire United States of America and indeed the people of the entire earth for the forgiveness of sins and thereby walking in Righteousness, Holiness, Truth and Complete Surrender to The LORD Jesus Christ. • THREE people saw: Large chunks of California to fall into the ocean! • THREE people saw: America split because she split Israel. Prophet Efrain Rodriguez was shown in a vision that a large meteor will hit near Puerto Rico and cause a tsunami 1,000 feet high which will be from 200 to 400 ft high when it hits the east coast of America. It will go inland from 20 to 100 miles. It will also split America from the Great Lakes to the Gulf of Mexico and large chunks of California to fall into the ocean. Meteor impact at 2am on Mona Island west of Puerto Rico. Expansive Shock Wave bringing 300 mph straight line wind to Miami. 1000 foot high Tsunami on Puerto Rico 2 am. 400 foot high Tsunami waves hit Miami 5 am then inundate the East Coast up to 100 miles inland. Martial Law and food scarcity & food riots follow. 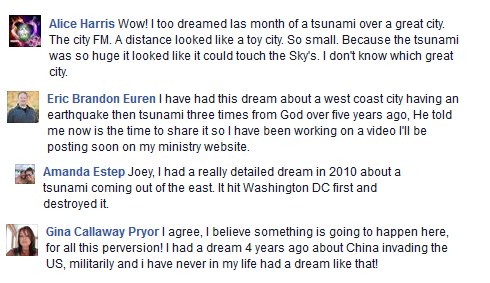 Perry Stone also has had dreams of a tsunami hitting the east coast. Perry Stone: “The most recent one, Sid, however, deals with tsunamis. 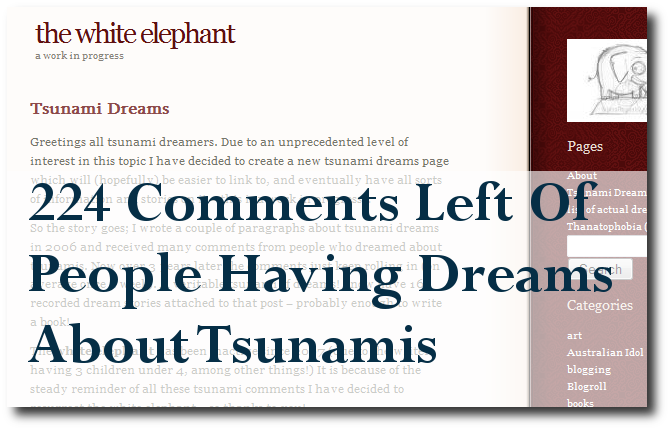 I probably, once every two weeks,I have a dream of a tsunami”. number of times it happens. And my wife keeps saying. “Why do you keep having these?” I said. appeared to have been on the west coast and the other was very strong on the east coast, which I thought was a little odd. But let me just tell you where I was and I’m not going to name the city. I’m going to ask people never to contact me and ask me. I will only release it if the Holy Spirit tells me, because it creates fear in people, and we shouldn’t do that”. At 18:53 in the video he talks about California being swept into the ocean. He saw the state of California, and it appeared to be fractured around the edge, broke off, and sank and then he saw a huge tsunami of waves. Then the water from the ocean rushed in upon the land and it was separated and sank into the ocean. “The dream I had was probably 2006, 0r 2006. I remember it was after getting saved. 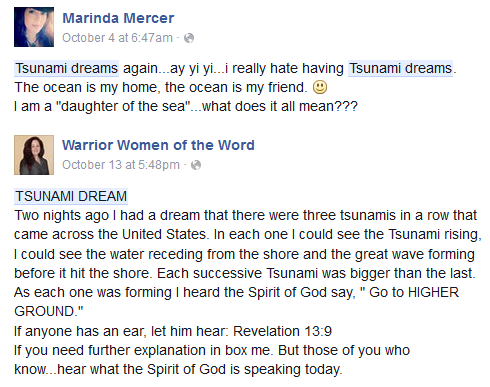 I was saved in 2002, I remember getting a dream about being on a beach. I remember family being there. We try to get together with family, since my immediate family, my wife and my 4 children we live in Indiana, we have to travel to get to her parents, or my parents. We try to do joint vacations. I felt this was a joint vacation. It felt real, and felt we were all together at a beach house. I was standing on a porch, on the east coast, facing the ocean, I remember the house behind me, as I turned around was all glass…..behind the porch was all glass windows. I remember looking out at the ocean, and saw a black line. The black line intrigued me… what is that? I have had a boat for years, and have seen a squall line, and thats what it looked like, and I said….wow, there is a storm coming in from the ocean. As I watched, it increased in size,…increased, increased, increased…until I realized ….oh my goodness, it is a wave. –Laura Crapo” I had a similar vision of LA. The land breaking and tilting people into the water. – pablozar26able Last year I had a terrifying dream about a tsunami. There was a big earthquake and many buildings were damaged. I found myself in one of these buildings and when I came out I saw a huge wave coming towards me. This wave was about 800 feet high and it made all the human made structures look small in comparison. I remember looking up at this wave and saying to myself…this is it…there is no need to run. I looked around me for some kind of protection and there was a small brick wall near me where I took cover knowing that I was about to die. I buried my fingers in the sand and closed my eyes waiting for the end. Something that impacted me about this dream was the color of the actual wave. The wall of water rising over the buildings was black in color. I have tried to interpret this, but I can only imagine that this wave is coming at night. Since then, I moved away from the beach. I now live in NC close to the mountains. This nation is about to experience the wrath of God for its many abominations against our creator. I am considering packing up and leaving before its total destruction. 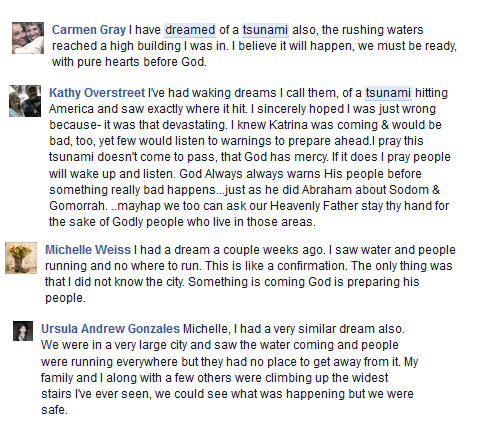 Eviie Rodriguez Sid, I had a similar dream as Perry’s about the tsunami. In my dream, I was riding a cab into New York City. We were about to cross this huge bridge when all traffic was halted. The middle of the bridge was destroyed & on fire, it looked like an asteroid had hit it. Then, in my dream, I was in another side of the city where I saw a huge tsunami coming toward the city. There was utter terror & chaos, people screaming & running in all directions. The police was trying to restore order but could not. It was horrible!! I think the Lord is warning of impending judgements that are coming to America! God bless! – shalom4u777 Thanks India 4 sharing your dream. 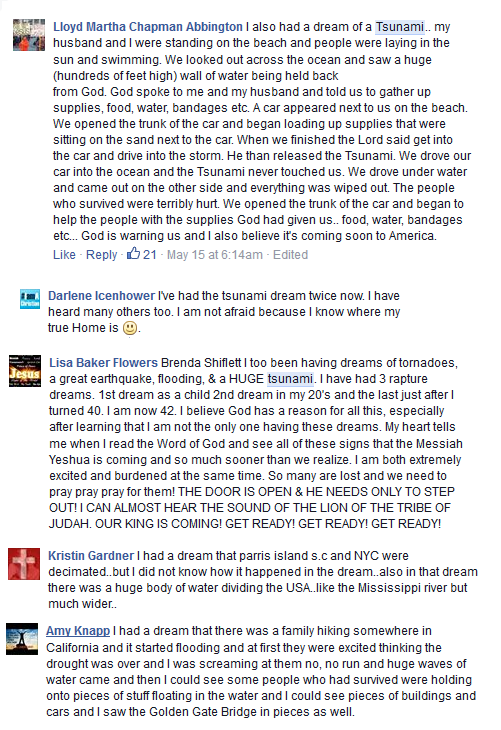 I would like 2 also share what Yahshua (Jesus Christ) spoke to me regarding a tsunami. On 08/25/13, he said: My child a tsunami is coming shortly. People will be unaware when this comes 4 they will be asleep. Many will die only a few will survive this. I do this so the remnant can see and experience this fear to tell others what had taken place. Unfortunately it has to take a disaster to wake up my children who walk in darkness. I have been patient I can no longer be patient with my children for I am ignored completely. Many will blame me for this tragic event and ask why did I allow this. This is my judgment upon America for the many sins that they have committed which is an abomination that has cause me to turn my head the other way. No more tolerance I say for my children my judgment has been set. Only a few are prepared if you are not I suggest that my children prepare and be ready quickly! I love you all but many do not see or accept me. Time is short, time is running out I come for my bride quickly…Yahshua (Jesus Chris)…..Shalom! -Virginia Boldea, the daughter of Dumitru Duduman, concerning the three comets. She was told by the Lord to expect this as the very first event of great severity that will impact America. -Tidal Wave to Hit the Eastern Seaboard by John W. Johnston at unitedstatesprophecy.com –Fall of 2005-I went into a deep sleep and had a dream I was on the boardwalk in Virginia Beach. It was night time and I think it was about 2:00 am. I put my foot up on the railing and was looking out over the ocean. There was what looked like a full moon on the horizon. I noticed just underneath the moon was a giant black wall on the horizon. The moon was reflecting white caps off the wall. As I stood there looking out into the Atlantic Ocean I realized that the white caps are from a massive tidal wave heading to shore. It was about 300 foot high. I felt the realization that it was too late to warn the people and the dream ended.In the fall of the following year, 2006 I had the same dream again.In January 2008, I had the same dream except this time I started running to peoples houses to wake them up and warn them, but it was too late.I feel like this tidal wave is a real tidal wave that is going to hit the eastern seaboard. I also believe this tidal wave might represent in the spiritual, a tidal wave of satanic destruction that is coming to destroy the people.To my amazement, in the months of April, May and June of this year (2008), I saw a group of people on the boardwalk in Virginia Beach anointing the railings and banisters with anointing oil. Even though I knew why they were doing this, I pretended like I was just curious and asked them. They told me they were anointing the banisters and railings for the whole Virginia Beach boardwalk because they had dreams that Virginia Beach was going to be hit with a giant tidal wave.